The building's fourth-floor addition earned a preservation award from the Cambridge Historical Commission. In each Transitions section of Preservation magazine, we highlight places of local and national importance that have recently been restored, are currently threatened, have been saved from demolition or neglect, or have been lost. Here's one from Fall 2016. 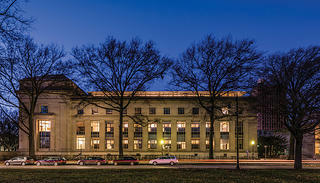 MIT’s Building 2, home to the university’s Department of Mathematics and part of the original 1916 Main Group complex, reopened this past January after a two-and-a-half-year restoration and renovation. The structure was renamed the Simons Building in honor of MIT alumnus James Simons and his wife, Marilyn, who helped fund the work. A top priority during the process was a detailed restoration of the limestone facade, which had cracked as a result of a too-rigid mortar used in exterior repairs during the 1960s. In addition, architect Ann Beha and her team updated the building’s mechanical systems to make them more energy efficient, modernized the windows with specially glazed double-pane glass, increased the amount of space dedicated to community and coworking areas, and added accessibility upgrades such as an elevator and sloped walks at exterior entries. With a new fourth-floor addition, which added approximately 14,000 square feet, the Simons Building update earned a preservation award from the Cambridge Historical Commission.